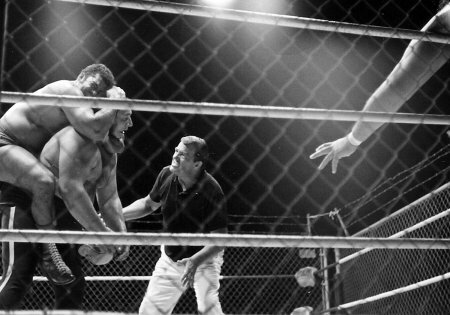 (1) A capacity crowd of 5,500 fans showed up at the Civic Auditorium to witness a cage match with the team of Curis Iaukea and Gorilla Monsoon vs. Ed Francis and Pedro Morales. 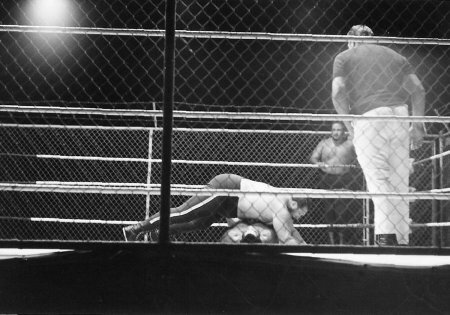 All four wrestlers agreed to this type of match, two week earlier all four wrestlers were counted outside the ring. 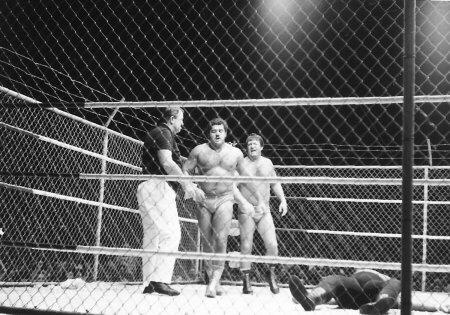 (2) Four other outstanding matches took place before the cage match. The results were: Dory Dixon and Rocky Montero battled to a no fall draw, Ripper Collins and Killer Buddy Austion retained their Hawaiian Tag Team Championship by defeating the team of Billy White Wolf and Nick Bockwinkel. In a midget tage match, Little Beaver and Jamaica Kid defeated Little Brutus and Sky Low Low. 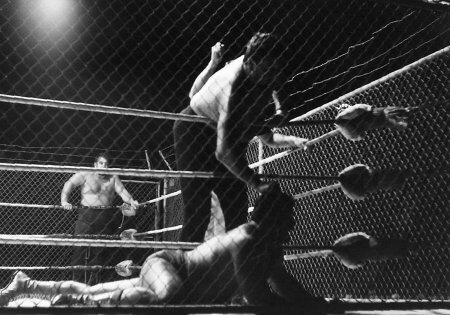 (3) For the cage match, the ring was surrounded by 130 feet of steel fencing, 8 feet high, with 3 strands of barbed wire on the top. There were two doors leading into the cage. Curtis Iaukea mauls Morales on the mat. (4) Iaukea and Monsoon entered the ring first and were locked in by Lord Blears. Then Ed Francis entered the ring and was attacked by Monsoon, while Iaukea slammed the door shut and Morales went nuts trying to get in. Finally Morales, with the help of Blears, was able to push Iaukea aside and Blears locked all four men in the cage. (5) The first fall came when Monsoon used a big splash on Morales in 4:32 of the match. (6) For the second fall, Morales applied a sleeper hold on Iaukea in 8:13 to even up the match. (7) The 3rd fall lasted only 3:03, Francis jumped on Iaukea's back and applied the sleeper hold. Monsoon ran into the ring and swung at Francis and missed and instead walloped the daylights out of Iaukea. this sent Iaukea out cold to the mat. Francis then covered and pinned Iaukea for the fall and the match. (8) After Morales and Francis left the ring, Monsoon attacked Iaukea, who was half asleep on the mat. 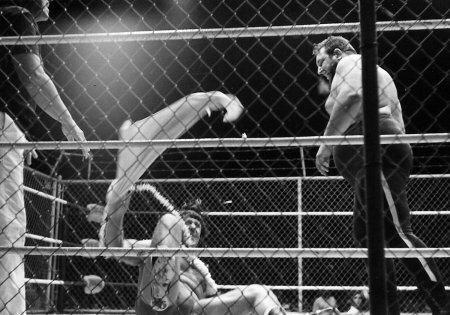 Monsoon began kicking, punching, and biting Iaukea until he was covered in blood in the middle of the ring. Monsoon left the ring and Iaukea had to be carried from the ring.